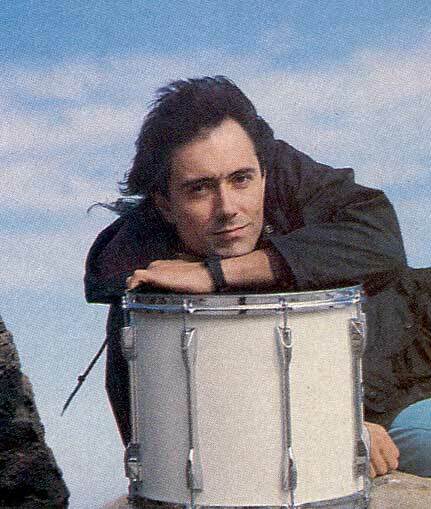 Individual style, quality, creativity, and Vinnie Colaiuta. Adam Seligman ventures out to California to discover the man who's been behind Frank Zappa, Joni Mitchell, and Gino Vannelli while remaining a leader in his own right. WHAT IS AN individual? What makes one unique? How does uniqueness fit into the act of creation? These questions come up again and again when dealing with certain drummers. What is the quality that allows you to know it's Steve Gadd who's playing on a pop song when the song itself has no outstanding drum arrangement? When you turn on a big band song on the radio, how can you say to yourself immediately, "It's Louie Bellson?" As I drove out to Vinnie Colaiuta's home, I started thinking seriously about these questions. The wide array of artists that Vinnie has played with - like Frank Zappa and Joni Mitchell live, or Gino Vannelli, Tom Scott and Patrick Williams in the studio - have some common denominators. Mostly, it's the improvisational elements that are possible within the framework of each of these artist's music - a certain "Vinnieness" in the left field approach to the charts or songs. But when you start to look at the singles, the pop albums, the aggressive jazz and fusion work that Colaiuta has done, the questions become less clear. Vinnie wasn't home when I arrived - a jingle had gone late. When Vinnie arrived he sprawled out on the livingroom floor. He tossed out answers that raised more questions, but always stayed near the interview, albeit with some left field comments. "A lot of people have asked me over the years, 'What do you do to create your own individual voice?' It's a difficult thing to assess. I've thought about it a lot and wondered whether or not it was a conscious thing or an unconscious thing. What you obviously try consciously is to emulate your favorite players. But hopefully if you don't get hung up on one guy's thing, it will just come out being like you. I was really into Tony Williams' playing, but when it came time to play Top 40 gigs, I couldn't play that way. It was just out of context. I tried to play it when I could because I thought it was hip. You either have to disguise it to make it apply contextually, or realize that some things don't fit in certain contexts and just use that stuff for what its place in music is." How does Vinnie do that? Does he just turn off his technique, or is it something more involved? "You say to yourself, 'This is a different bag, this is a more commercial bag and I have to do this now.' You have to realize what belongs where. I think that once you understand that, it's the first step to becoming a well-rounded, accomplished musician. You find that everybody goes through their own personal process of editing. That applies to drumming just like it applies to colors. Your favorite color may be red, mine may be blue. By the same token you might want to play a certain lick leading with your left hand because it feels good to you. I might not want to do that." Vinnie laughs, and shakes his head as though demonstrating a rhythmic pattern. "You might prefer a paradiddle-diddle and I might prefer a double paradiddle. Those stickings, because I like those stickings, will influence how I play all those types of patterns around the drumset. That way of thinking is just part of you, and if you let that happen and you don't inhibit it, that particular aspect of you combined with what you've learned will fuse to create your own identity along with other things, ideas, and concepts." "You'll just prefer certain stickings. That's usually a natural selection process. I use stickings to illustrate something really tangible and concrete; it's a simple concept to grasp. Just as certain kinds of grooves involve certain stickings - you can extend those stickings and say your body will always tend to want to do this type of thing. That's one factor that gives different players their style. They favor patterns and they favor sounds and they favor sound sources and they favor the way their body wants to lead. I don't know if it's because their mind wants to do it. You say 'I do it this way because it feels good.' You're talking about feeling, you're talking about an emotion and a physical sensation. But obviously it all comes from your brain telling your body what to do." "You favor certain things and then you edit out the things you don't like after you've already learned them. It's the same thing as 'You learn the rules and then you forget them.' Well, that's basically what all of the greats have always said and I think that applies to identity and style." 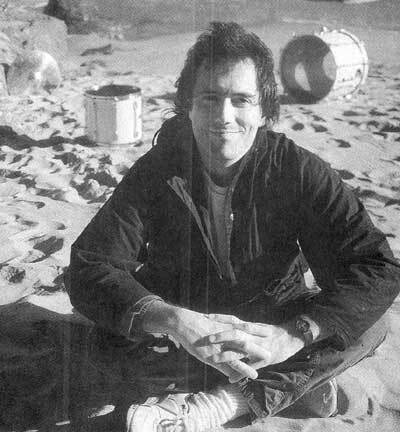 VINNIE COLAIUTA first burst into the public consciousness during his very heavy playing years with Frank Zappa. Rather than retell that story again, we moved ahead with where his style and technique came from as first heard with Zappa, then later as he revamped his playing to work in the studio and with Joni Mitchell. "Frank Zappa was a pivotal figure for me - I'd been listening to him ever since I was a young kid. He always had an impact because he was so unabashed, brazen ... his outlook on the world, it hit me at a time in my life when I was wanting to be rebellious. It wasn't like your run-of-the-mill heavy metal rebellion where you have chainsaw guitars and power nuclear holocaust victims ... I don't know what these kids are trying to symbolize; I don't know what they're trying to get across. It's some kind of bizarre dark power trip. Zappa's thing was a whole different kind of thing, almost a parody of society and what society had become. I could relate to that. It reflected my whole view of society at that time." "Musically I also found it interesting, it was very different. I always listened to him when I was growing up. When I moved out here to L.A., I had started listening to Live in New York and his later records. I was starting to really get into it. I was studying it and practicing his music a lot. All of a sudden I heard he was auditioning people, and I started buggin' him... "
"That's a whole other story. I established a real good rapport with him as I started to get to know him. He was always a big influence on me - I regard him as a brilliant composer, a genius. Rhythmically I had always had an interest in things that were left of center, and things that were different and stimulating because of what they are musically, why they exist in nature. An example would be polyrhythms or rhythms that aren't necessarily part of the norm in Western society at this time - or that time; rhythmic things that provided me with mental stimulation. I realized that Zappa utilized a lot of that rhythmic structure in his compositions, he was a big advocate of it and it showed in his music." "I was always a glutton for information when I was learning. I just always tried to learn as much as I could and when 1 was at the Berklee College of Music, my teacher, Gary Chaffee, would help me hone a lot of this rhythmic information to a finer degree. Frank showed me how to apply it musically to a situation that I'd never seen before firsthand. That type of playing doesn't usually exist outside of an academic realm." "When I say academic I'm talking about school or situations where you have to create without media propagation. You don't hear this kind of music on the radio because it's not Top 40. You might hear it on a public access, school sponsored, or after-hours station, but for the most part it's not even in the realm of the American consciousness. It's such a small part - almost the subconscious." "At this point it's the difference between art music and popular music. Sometimes art music can become part of pop music after a while. I don't know how you can make a living playing it, but somehow Frank managed to cleverly incorporate it into his thing because that is also a part of his whole brilliance - how he could make it all happen that way." "The thing was I got a firsthand look at how to be that and that was my gig. At school I could sit down with Gary and just work stuff out. We would look at whatever musical examples existed and analyze it and just really get cerebral about the music. It was another thing for me to get cerebral about it with Frank and actually get to hear me with it. It's the difference between learning it in an academic environment and applying it. At the same time, Gary taught us to be musical about it, not just intellectual." After several years with Frank Zappa and a series of recordings (Joe's Garage, Tinseltown Rebellion, and the Shut Up And Play Your Guitar series), Vinnie decided to leave the roadwork with Zappa and concentrate on a Los Angeles-based studio career. The reasons for that were complex but were based both on economics and Vinnie's long standing interest in recording. "What happened was I was playing clubs in town and people wouldn't call me because they saw me ... I came to town and I was blowing. I couldn't sit in clubs and just play grooves. At that time I didn't want to do that. I was all out to the wall, that was what I wanted to he. I was really into blowing - just coming from a different space. I'm all for playing a great groove into the ground and playing something when it's supposed to he played. It's all music. I like blowing too if that's what the music is supposed to be about and it's not in the name of self indulgence." "I'm not going to get into a big philosophical thing about what's right or wrong. I mean, what if you want to go play a gig and you haven't played a live gig in a year; you've been cooped up not getting a chance to voice your own thing at all? If you go out and just play your brains out in one night, are you being self indulgent? To me that's not self indulgent because you need to get it out. You have to do it somewhere. Sometimes you just can't do it when the red light goes on in the studio." But do people want to hear that? "There's an audience for all of that. People got hip to me pretty fast and they enjoyed it. I was just running up against other people who would say 'I wouldn't hire him' which I realized because I wasn't getting any calls for the dates. But some people took a chance and they saw I could go into the studio and play what I was supposed to play in the studio." I posed the question of how Colaiuta, with this wild playing experience, could go into studio work. Was he the typical choice of music producers? "No, I wasn't. The reason I left Zappa was I wanted to he able to work when I wasn't on the road. I'd be off for three months and it wasn't enough time for anybody to get to know me. I had the opportunity to record two albums at the same time, one was Nightwalker by Gino Vannelli, the other was with a group called Pages, which is now basically Mister Mister. Those were two important projects for me because I know that Gino had some commercial success with the Brother To Brother thing, and it was a commercially viable move for me to record with him. I know he had a pretty good audience from that and he had had a hit. I thought it would establish me a little better. Carlos Rios and Neil Stubenhaus had recommended me to Gino." "It worked out where I rehearsed with Gino for six weeks and spent a month in the studio. I was working with Gino from noon to six, and Pages from six to whenever. This went on for a good month. We're talking about fourteen hour days for a month, on these two projects. It helped my studio technique. I had some problems with those things too... it was real tedious. Gino is a real stickler, a perfectionist. Then at night, I'm working with Jay Graydon, who's also a real perfectionist. They wanted me to be creative, but it had to fit their stylistic mode - I couldn't go and play the way I played with Frank with them. Definitely fusion oriented funk rock kind of stuff. It worked out okay, the end results. That was why I left Zappa." The next transition for Vinnie was joining Joni Mitchell for two albums and a tour. It seemed a bit of an odd move, but Vinnie defended it vehemently. "Most people don't think of Joni's music as a heavy drum gig. When we went out on the road, I created a good balance between wanting to blow and the sensitivity of the music. The band was me, Michael Landau, Larry Klein, and Russ Ferrante. We had a really good intimate situation where we could be really musical. We made it our thing. It wasn't 'well, this is going to be real soft folk music.' It wasn't like that at all. We were playing some really nice grooves and we put some weight to the songs." With Joni Mitchell, Vinnie showcased a new side to his identity, going from the freedom of Zappa to the process of the studio to playing songs. "We were playing songs and the song structures that were geared to having more constant things that accompanied the lyrics. With Frank's thing we would play songs where you would set up a groove and play fills and the texture changed somewhat, but a lot of times you might change the groove up; instead of the more traditional song forms with Joni where we utilized a lot of dynamics and were creative with song structures, like taking forms such as AABA or whatever and building it the way you would shape a song." "With Frank, the way the music was subservient to the lyrics was a completely different way. Sometimes we would have traditional song structures but other times we would have pieces of music where the music was subservient to the lyric in such a way where we would play a vamp, and as soon as the lyric would say something, we would completely change and play a different kind of groove, different tempo, different everything, that had nothing to do with the original groove. Then we would stop playing, go completely free and play colors for another part. We would operate off cues - splashes - it was theater oriented in that respect. Then there were other things that were written out like legitimate pieces of music." "Joni's thing was more like being creative within a song framework and the music served the lyrics in a different way - texture changes instead of complete groove changes. It was a very musical situation and I loved it. It was very mature and I was really glad to have been involved in it." On the very subject of being "involved," drummers tend to have a close working relationship with bass players. Usually, in a group situation, you have a regular bassist you work with who you get to know over time. As a studio drummer, Vinnie Colaiuta has several bass players he works with regularly on album projects, film and television scoring, and jingles. I asked Vinnie for some thoughts on some of these players. At first he was hesitant about leaving out a good friend or a potential employer. But after we exchanged a list of four bass players, and noticed that we both picked the same four, Vinnie relaxed and talked about his close working relationships with bassists Neil Stubenhaus, Tim Landers, John Patitucci and Jimmy Johnson. "The process for each individual is usually the same - it's a process of listening to one another. Really working with one another without getting in each other's way. Each musician is real mature that way. They will really listen. It really boils down to listening real hard and just getting comfortable. Take Neil Stubenhaus and I, for example - he knows me like a book. He's played with me so many times that he knows how it is that I'm playing. There's a lot of trust involved between us. Neil is a great musician." "Say, with Tim Landers, who's also a great player, he's worked with me a lot and he knows how I play. He listens - he's got real big ears! That's what it takes. He's worked with a lot of great drummers so he has a handle on it. I met Tim and Neil at Berklee when I was at school there. I met John Patitucci when I was out here. With John you have a guy who has a tremendous facility on bass, upright and electric, but he's not a guy who's out there for himself, who can't work with a drummer because he needs all the space. He's not like that. He knows how to incorporate the role of the bass player and how to go way past that. He's very balanced, he can lay it down. A lot of players with that much facility don't know how to be supportive. He does." "You take Jimmy Johnson, he has tremendous facility arid also can be supportive and he listens real intently too. He's a very precise player as well. All these four players are great listeners and there's a lot of trust between us." 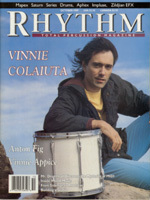 Vinnie Colaiuta is best known for his studio work and his rock and pop playing. But he began as a jazz drummer with Tony Williams as his musical role model. Recently, Vinnie has started to show up on an increasing number of contemporary jazz albums, many on the Passport jazz and GRP labels. He has to a great extent become the West Coast Steve Gadd, playing everything but known for giving that certain "Vinnieness" to a project that raises it above the mundane. I asked Vinnie about that jazz side of his playing, having seen him in local clubs with Brandon Fields, the Joni Mitchell offshoot Dog Cheese, and guesting with Eliane Elias. "I considered myself a jazz influenced player, but I was really into fusion too. I liked a lot of different things, I was always like that. I went through periods where I just listened to Mahavishnu or I went through other periods where I was influenced by Miles Davis and very influenced by trios. Other periods I was more influenced by rock 'n' roll. I was always a conglomerate of a mixed upbringing. I saw a lot of validity in many different kinds of music. I like the trio thing where there was a lot of interaction involved, where it didn't mean the role of the drummer was to play real simple and light and barely hit the drums. 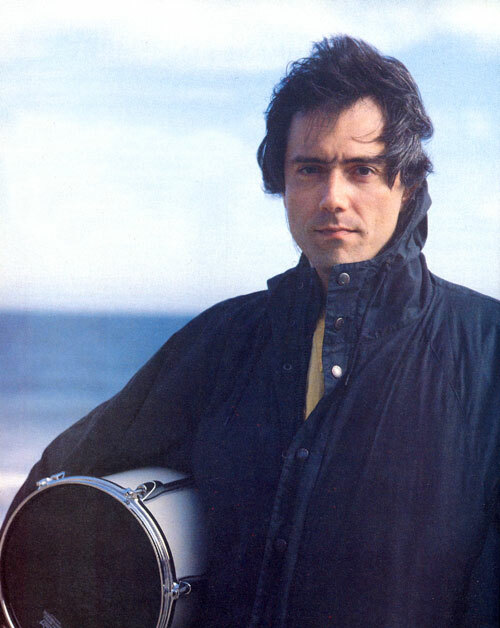 I liked when a drummer could be sensitive but completely uninhibited dynamically and rhythmically. That doesn't mean he has to be a total monster all the time and just play all over the place. When Tony played he would keep time, but then he would play something unbelievably interesting because he had the freedom to do that when it was the right time to do that." "A lot of people don't know the different sides of me and I think that a lot of times if I haven't played with a trio in a while, I might be a little uncomfortable sitting down and feeling at home with that kind of music. But after a couple of gigs I feel more comfortable. The thing is I was educated and had that influence in my upbringing to a certain extent and I love playing it. I didn't want to approach it as the type of guy who when we were playing in clubs had to play real soft all the time and play just so because stylistically that was the way. There is a whole way of thinking among bebop players that you have to play just this way and that all the rhythmic figures go this way too. That's not my dictum, that's not what I'm about, so I just play - I let it rip. I played loud when I wanted to, I played soft when I wanted to, I played real inside when I wanted to and real outside when I wanted to." "When I say when I wanted to I don't mean I now impulsively want to play outside even though it has nothing to do with the other guys because I want to draw attention to me. WRONG! I mean I feel it would be musically relevant - I'm there, part of this event, and I'm doing it because it's what I feel now. It's not valid because I'm thinking it out rationally - I'm reacting and emotionally knowing that it's valid. I don't stop to think about it, although it's not on automatic pilot either. It's improvisation." "The way I am as a person may have a lot to do with how I play the drums. I don't know, that's a whole other kind of issue that I've often wondered about - whether you could separate your musical being from just the way you are. It's just who you are I think." For Vinnie Colaiuta there's a fine line between being and doing musically. It's in what you've learned, and who you are. It's in being an individual, who can work with other musicians. And finally, for Vinnie, it's in being himself.